Last week, I told you about our Great American Road Trip, a 6,000-mile cross-country adventure with our 4 dogs in our RV. Some of you may be interested in exploring the RV Lifestyle as a potential for retirement, but you don’t yet have an RV. Today, we’ll look at the option of renting an RV as a way to test drive the RV Lifestyle. Ironically, I know nothing about renting an RV, and I’m far from an expert on the topic. Fortunately, Jane is an expert on renting an RV, and she’s agreed to write today’s guest post for the benefit of you, the reader. Jane works for Outdoorsy.com, an online RV rental marketplace that connects RV owners with potential renters to provide a new way to travel, and a new source of income for owners. I wasn’t aware of Outdoorsy, but after looking it over I think it’s a valuable resource for folks looking at a creative solution for renting an RV. For the record, I don’t get any compensation from Outdoorsy for this endorsement, I’m simply passing it along as a resource I thought may be of interest to you. Anyway, Jane reached out to me a while back with a suggestion for a guest post about renting an RV. 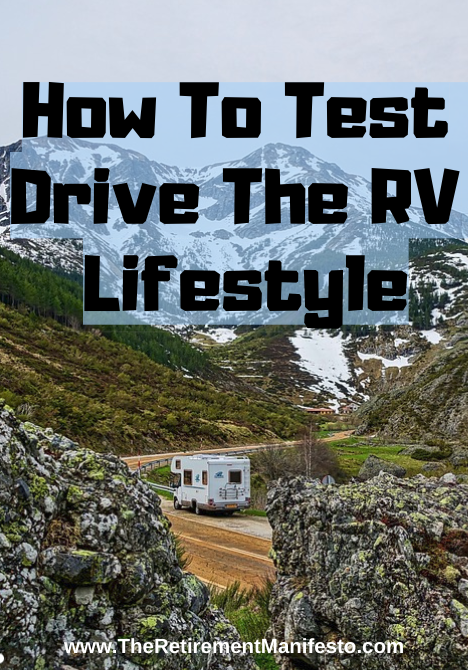 Knowing I was going to be sharing our plans for The Great American Road Trip, I thought it would be useful to follow-up that post with an expert’s thoughts on what’s involved if you’re interested in renting an RV as a way to test drive the RV Lifestyle. Even better, Jane has agreed to respond to any reader questions about what’s involved in renting an RV (or, if you own an RV and are considering renting it to others but would like some additional information). If this article intrigues you, but you have some questions, simply drop it in the comments and she’ll weigh in with her thoughts. Been dreaming about taking a road trip around the country in an RV but don’t want to buy one? Lucky for you, renting an RV has never been easier. With an RV rental, you get the best of all the worlds. You get to take the vacation you’ve been dreaming about without taking the financial plunge of an RV. Outdoorsy makes it super easy to pick an RV and hit the road in little to no time. But if you’re not sure how to get started, these tips will make the process a whole lot easier. Before you book an RV, you’ll want to have your route plotted. With most RV rental companies, including Outdoorsy, you are allotted a certain number of miles per day. Some rentals have 125 miles a day, others have unlimited. This is something you are going to want to keep in mind when mapping out your travels. Luckily, you’ll be able to drop off your RV exactly where you picked it up when you are finished with your trip, so you don’t have to worry about that too much. RV rental companies offer rentals almost anywhere in the world. If you’re looking at an international trip, see what RV rental looks like there. Plan out how many days, where you plan on camping, and which destinations you absolutely need to see. This way when it comes time to book the RV, you will know where you’re going and how long you’re going to need the rental. Nothing will ruin your vacation like finding out that there are no available RVs for the dates or destinations that you have planned. Because traveling in camper vans and converted vans has become more and more popular, demand is hot, especially during busy seasons like springs and summer. Booking as soon as possible ensures that you get the ride of your dreams. Once you have your route picked out, book your campsites. Think about what amenities are important to you and the location. Do you want electric, sewer, and water? Do you want to be by a lake or in the middle of the desert? Do you want incredible views or is that not as important? Are you looking for a resort style with restaurants and close to lots of attractions or are you looking for something more remote to reconnect with nature? Booking your site ahead of time ensures that you have a spot to stay and that you’re getting the amenities you want. Luckily, most RVs have everything you need; a kitchen, a bathroom, and a comfy bed. You don’t need to pull over every time someone drinks too much water. When it comes to pitstops, stop at roadside attractions and points of interest that you might be interested in. There’s a chance that you’re in the car for hours at a time so you’ll want to stretch your legs, especially if you’re the one who’s doing all the driving. Plus what would an RV road trip be without a stop at the giant dinosaur on the side of the highway? Last but not least, enjoy yourself. RVing around the country is an experience that many do not take. You’re in a home on wheels for an extended period of time and it’s one of the best bonding experiences you can take with your friends and family. Not to mention the once in a lifetime opportunity to see some of the most stunning destinations in the world. Go on hikes, go swimming, fish, sit by the campfire and tell stories. Although we have not covered the cost, that is because there are so many variations. Rving can be done really inexpensively or it can be a luxurious extravagance. The choice is yours. Everyone, of course, has a different budget. The best place to start is to have an idea of your personal budget. If you are renting the price is charged per night and includes a specific number of miles and hours for free. For smaller and basic RVs, the cost can be quite reasonable. There are additional charges for usage of a generator or miles above the daily allowance. Other expenses that need to be considered are the campsites or overnight fees. Free camping of is often available if you search “boondocking” with the location you will be in, there is an abundance of information on safe, stunning spots where you can spend the night or week at no cost to you. Once you rent an RV and travel the world, you are never going to want to go back. Whether it convinces you to pull the trigger on buying your own or sparks a new tradition where you rent an RV every year with your family, once you experience it, you are never going to want to stop. Thanks, Jane, for sharing some tips from an expert in RV Rental! For those of you thinking about giving it a try, I encourage you to take advantage of Jane’s offer to answer any questions you have. Simply drop in a comment, and click on the option to get notified when you get a reply. If you have an RV and are interested in possibly renting it out, Jane can help with that, too. RV’ing is a great option for retirement. If you’ve ever thought about it, but you’re not sure if you want to spend the money to buy your own rig, I’d encourage you to give renting a try. Who knows, maybe I’ll run into you somewhere on the road!